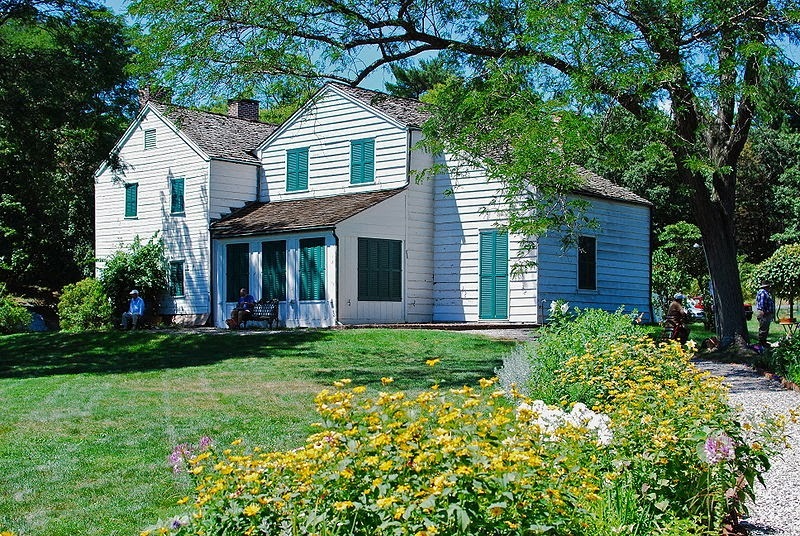 Susan Warner and her younger sister Anna were teenagers when their widowed father Henry Warner bought Constitution Island across the Hudson River from West Point. The year was 1836, and their uncle, Thomas Warner, was the West Point chaplain. While visiting him, Henry first saw the island, which still contained remnants of fortifications from the Revolutionary War. 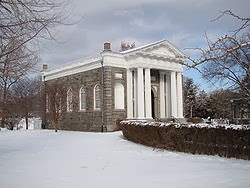 At the time, Henry Warner was a successful New York City lawyer and planned to build a mansion on the desolate island. However, after a series of financial setbacks, Henry Warner was forced to give up his city town home and move his family to the island where he built a farmhouse instead of a mansion. Life changed dramatically for the sisters, who not only had to adapt to country living, but also learn how to work the land to grow food for their survival. As Susan and Anna grew older, they began to write for income to help support the family. 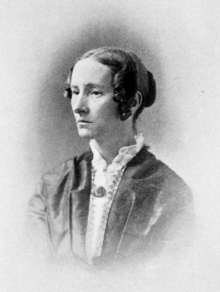 Susan was the first published, and her book The Wide, Wide World, became the country’s first best-seller, selling a million copies in 1850. The devout Christian sisters wrote hymns, nonfiction religious works, novels, and children’s stories, sometimes under the pseudonyms, Elizabeth Wetherell and Amy Lothrop, respectively. Together they published over seventy pieces of work. Miss Susan and her "boys"
After each of the boys had read a Bible verse, Miss Warner, choosing her subject from some New Testament text, talked to them for perhaps half an hour until her enthusiasm and interest had obviously almost exhausted her small strength…she always gave to the boys the brightest and most optimistic side of the faith she loved so well. When she had finished and lay back pale and weary against her cushions, her sister, Miss Anna, came down from the house with the rarest treat of the whole week, tea and homemade gingerbread.” In 1885, Susan Warner died and Anna took over teaching the class. Despite economic hardship, Anna refused many offers to sell the island. But shortly before Anna’s death in 1915, Mrs. Russell Sage, a generous benefactor bought the island, and together, she and Anna deeded the property to West Point to be maintained for its historic preservation. Many years have gone by since the sisters passed away, as have the cadets they taught. But Susan and Anna’s most important lesson has lived on, reaching millions. Perhaps you never heard of Susan or Anna Warner. Yet you may have sung a song they wrote. You see, in 1860, Susan penned the novel “Say and Sea,” which contained a poem written by Anna, called “Jesus Loves Me.” Two years later, musician William Bradbury found the poem and set it to music. I have never heard this fascinating story before. Thanks for sharing it, Marilyn! Thank you, Vickie! Don't you just love "discovering" pieces of history? Marilyn, what an interesting story. Thank you for sharing! Thank you, Margaret, for reading it and commenting! Thank you I really enjoyed this post so full of facts that I never knew. What interesting sisters. Thank you, Jackie. I too, was surprised to learn about these sisters. The novel I'm now editing is set in 1888 and my hero is an 1886 graduate of West Point serving in the Cavalry. This information is great and very interesting. I might include a comment about Miss Susan and Miss Anna's lessons as well as the gingerbread in my story as I revise portions. I love learning little bits of information like this. Martha, I'm so glad this post gave you details to use in your story. Your hero may have sung "Jesus Loves Me" too. For more details that I left out due to space restraints, go to http://www.constitutionisland.org. Thanks, Marilyn. I will. I love adding little true tidbits like that to my stories to give them more authenticity. Marilyn, this was a fabulous post. I loved it. Of course, I adore all things New York State history :) I can't believe I've never heard of this sweet story before. My parents dated in and around this area, and Bear Mountain was one of their favorite spots, nearby West Point. Thank you so much for sharing this wonderful slice of history. Kathleen, so glad you enjoyed it. I visited the Hudson Valley area for the first time four years ago when my husband, a West Point graduate, and I went back to see his old alma mater. I thought the area was so beautiful, but I didn't know about the sisters then. Marilyn, I love this post. So interesting!! Wonderful post, Marilyn! I visited West Point for social activities when I was a student at Nyack College many, many years ago, but did not know about the Warner sisters. Thanks, Susan. Constitution Island is now a West Point museum that can be visited by scheduled boat trips across the river. I'd love to do that some day! What a lovely post! I'm so glad you shared this with us today - I had never heard of the Warner sisters before and loved learning their story. Thank you, Winnie. I was happy to discover their story. Thanks, Paula. Isn't it wonderful to know how their faith has left a legacy? God bless those Warner sisters! for their diligence in teaching the Bible to children. Very interesting post. I agree, Sharon. And God did bless them indeed! How very blessed we all are when we sing those beautiful words to Jesus Loves Me. Thank you Warner Sisters. This was such an interesting post. Thank you. Thank you, Melanie. When my husband and I go to nursing homes to sing with our choir, the residents always know that song and sing it with us, even when we didn't even think they knew we were there. I hope and pray we still teach that songs to our children. Thank you for sharing this wonderful piece of history! Thanks for such a sweet post! It makes me smile every time I think about it! Anytime I read/hear anything about West Point in the future or hear the song Jesus Loves Mes I'll remember Susan & Anna Warner! Thank you. My husband, a West Point graduate, says this is his favorite song too, but didn't know the story behind it. Maxie, so glad you enjoyed the story and love the song as countless others do!